Dam rehabilitation work has begun and Chapman Lake has been drawn down. The work is expected to be completed by February 2019. Fishing, boating, swimming, waterfowl hunting, metal detecting, or entering the lake bed (with or without water) for any reason is prohibited. Be alert for construction traffic and road closures. Adhere to posted warning signs. During construction; hiking trails, campground, cottages, yurts, and some pavilions will remain open during normal seasons. The mooring road is closed. Work to be undertaken while the lake is drawn down will include 70,000 cubic yards of sediment removal, as well as repairs to the dam’s control tower and spillway concrete, to bring the lake in compliance with statewide flood requirements. A fish habitat improvement project also will be undertaken. We appreciate the drawdown will be an inconvenience to anglers, boaters, and other visitors, but the integrity of the dam and safety of our park visitors is of the utmost importance. It is a short-term inconvenience for a long-term improvement. Safety, fish habitat, depth, and function all will improve. Presently, the spillway fails to meet requirements of a Probable Maximum Flood – one that could result from the most severe combination of rainfall and hydrologic conditions for the area. To remedy the situation, the dam embankment will be armored with concrete, enabling water to safely overtop it during an extreme flood event. Work will bring the dam into compliance with guidelines established for safe operation and maintenance of dams by state Department of Environmental Protection’s Division of Dam Safety. The 805-acre Chapman State Park includes the 68-acre Chapman Lake on the West Branch of Tionesta Creek. 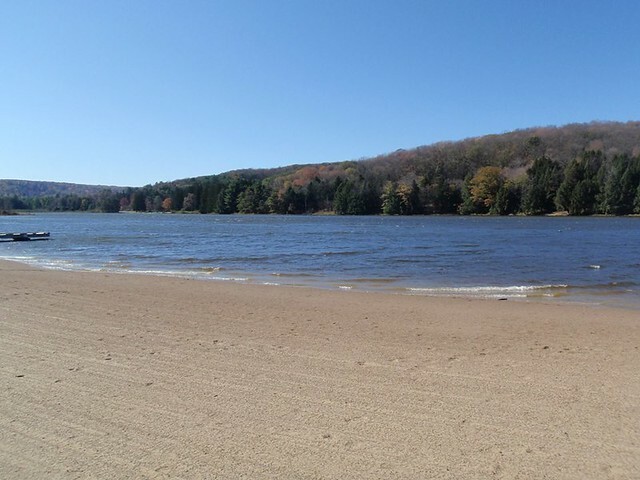 Adjacent to state game lands and the Allegheny National Forest, Chapman is an oasis of recreational facilities in a vast area of wilderness. The park is off US 6, in Warren County, near the town of Clarendon, and is adjacent to Allegheny National Forest and State Game Lands 29. Turn on to Railroad Street in the town of Clarendon, which becomes Chapman Dam Road. Follow Chapman Dam Road 5 miles to the park. Special programming is available upon request.